Principal Cast : Adam Sandler, Andy Samberg, Selena Gomez, Kevin James, Fran Drescher, Steve Buscemi, Molly Shannon, David Spade, Cee lo Green, John Lovitz, Luenelle, Chris Parnell, Jackie Sandler, Rob Riggle. Synopsis: Dracula tries to protect his daughter, Mavis, from falling in love with a human, Johnny. What we think : A tired and overplayed plot is covered by a smorgasbord of character design and rapid-fire comedy, mixed with dynamite animation and a refusal by the filmmakers to slow down for a second and… you know, develop the characters. When the story does try and slow down a little, the film comes to a dead stop (get it? “Dead” stop? ), but when it hits its straps the thing just powers along without pausing for breath. Look, it’s good for the kids, and will probably entertain most adults who don’t expect a lot, but after a second or third viewing it’ll probably start to annoy more than it entertains. Worth at least one watch, but that’ll be about it. Room service is optionally scary. One of the great things about having young children is the excuse it gives you to watch a lot of animated films. Some might say this is a curse (and to a large extent, those people are probably right), but at least I still get to see plenty of films even when the kids are scampering around the television, and that’s gotta count for something. Every so often, you get to see a Frozen, or a Cloudy With A Chance of Meatballs, and every other so often, you have to endure a Planes or a Shark Tale. Swings and roundabouts, people. Hotel Transylvania, the latest film out of the Sony Animation stable, is yet another of the whirligig riot of color passing as a movie these days, a frantic, entertain-at-any-cost endurance test for more reserved, conservative viewers, but an experience which will no doubt captivate a lot of the younger kids this flick is aimed at. It’s filled with all the classic cinema monsters (and even some new ones!) as it tells a story of Dracula and his attempts to keep his daughter from experiencing the “outside world”, a traditional “rebellious teen/overprotective parent” narrative that does little to stimulate the intellect, even though the film feels like drinking a hundred Red Bull’s through your eyeballs. Dad, you really don’t understand me, do you? Is it the fangs? Is that it? Plot synopsis courtesy Wikipedia: In the aftermath of the death of his wife Martha (Jackie Sandler), Count Dracula (Adam Sandler) designs and builds a massive five-star hotel in which to raise his daughter Mavis (Selena Gomez) and to serve as a getaway for all the world’s monsters. Famous monsters such as Frankenstein (Kevin James) and his wife Eunice (Fran Drescher), Wayne and Wanda Werewolf (Steve Buscemi and Molly Shannon) and their massive immediate family, Griffin the Invisible Man (David Spade), and Murray the Mummy (Cee Lo Green) often come to stay at the hotel which is completely human free and safe for monsters. On her 118th birthday, Dracula allows his daughter to leave the castle in order to explore the human world, but he sets up an elaborate plan using his zombie bellhops disguised as humans to make them seem intimidating and frighten her home. The plan works, but the zombies inadvertently lure a 21-year-old human named Jonathan (Andy Samberg) to the hotel. Dracula frantically disguises him as a Flesh Golem and passes him off as Johnnystein, a distant cousin of Frank’s right arm. Johnny soon encounters Mavis and the two “Zing” (a form of magical attraction). Unable to get Johnny out of the hotel without the monsters noticing, Drac quickly improvises that Johnny is a party planner, brought in to bring a fresher approach to his own traditional and boring parties. Johnny quickly becomes a hit to the other monsters, especially Mavis, and even begins to gain Dracula’s respect. Dracula then tells Johnny that he dislikes humans because of the death of his wife at the hands of an angry mob shortly after Mavis was born. Much to Dracula’s surprise, Johnny shows understanding and knowledge of the vampire lore. But it’s when Johnny and Mavis start to fall for each other that things start to take a turn for the worst! 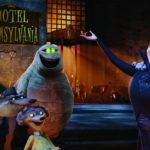 Hotel Transylvania takes the old classic monsters – Dracula, the Mummy, Frankenstein et al – and spit-roasts them in a modern, slick-slide sensibility that is easily digested by the kiddies. The film pokes fun at the archetypal stereotypes, such as Dracula’s accent, or Frankenstein’s fear of fire, and puts it all inside a modern day storytelling arc; while the story itself isn’t new, or even terribly creative, the film ambles along on the back of its funny characterizations, and whip-smart set-pieces. Oh, and the dazzling animation. Let’s not forget the dazzling animation. It’s a hodgepodge of ideas and concepts that probably doesn’t connect with its intended audience all that well, because the creatures involved are more adult than the film might present – how many six-year-olds have seen a Dracula film, for example? Or pre-teens sat down to witness a werewolf movie? – and I suspect the reason it didn’t pass muster with the younger crowd was this inherent disconnect. I guess the premise of these scary monsters being more funny than scary will keep the kidlets laughing a fair bit, but a lot of the more subtle humor is derived from the cliches these characters exhibit – vampires abhorring sunlight, since it makes them combust in a fiery death, is glimpsed towards the end, when Dracula makes a lat ditch effort to stop Johnny leaving during broad daylight, is a particularly funny thing for me, but whether a youngster “gets it” or not is another matter – and it’s this facet of the film I think is tangentially off-balance. When you guys want to come into my boudoir, you have to knock! The story, which is basically the old trope of an overprotective father wanting to keep his young daughter locked away from the troubles of the real world, delivers exactly the emotional beats we’ve seen in these kinds of films so often. Mavis and Johnny must overcome their inherent physical differences, while Dracula must overcome his overdeveloped paternal protective instinct. Yeah, it’s not new. In fact, much of the film isn’t a surprise, at least as far as story and narrative goes. What is surprising is just how cleverly this weakness is buried beneath a cavalcade of superb animation and razor-sharp pacing. 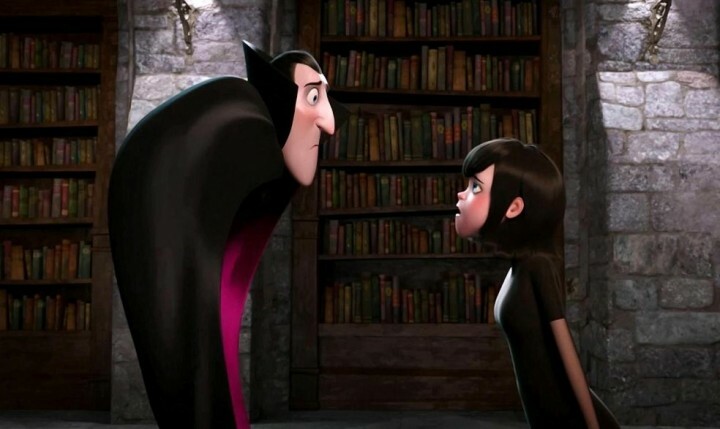 Hotel Transylvania barrels along at a rapid clip, daring its audience to look away for a moment as it moves from one joke set-up to the next within mere seconds, as the animation traverses the physically impossible with the outlandish and Looney Toons-esque caricature with ease. 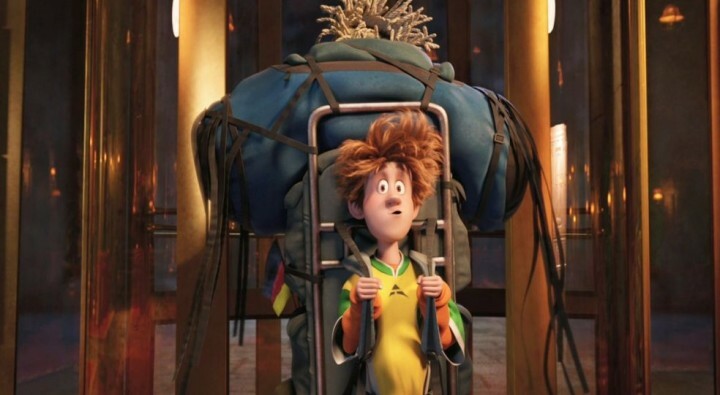 The film is superbly animated (as they all are these days, I think), but where this film differs is just how quickly it all transpires on the screen. Say, I’m leaving already? I only just got here!!! The film’s locomotive pace leaves little room for subtlety or nuance, as the characters override the plot deficiencies (would this count as a positive, though?) with enormously entertaining antics, from mugging at the camera, removing body parts, farting, burping and vanishing; this isn’t a film of subtle wit, rather it’s an in-your-face example of filmmakers trying to keep the younger crowd interested instead of looking down at their Facebook feed. 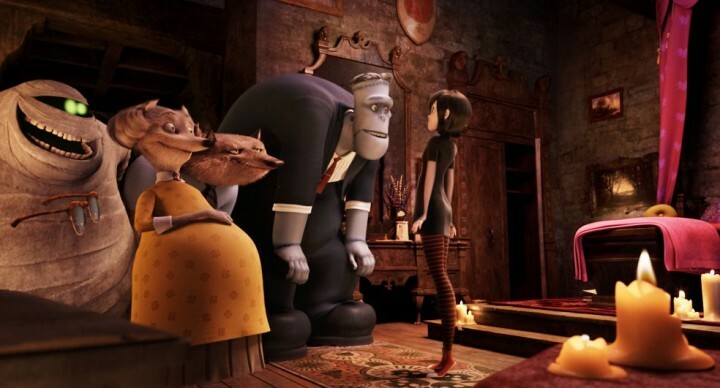 Taking that into account, Hotel Transylvania manages to remain breathlessly entertaining, even on a superficial level. 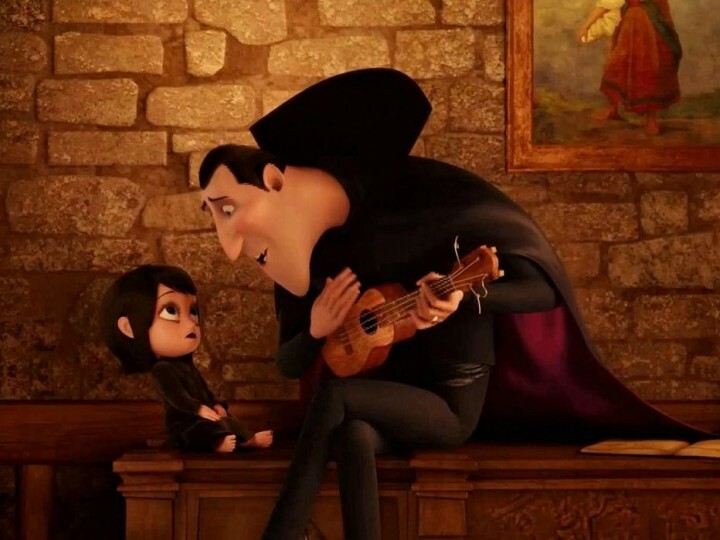 Adults might find it all a bit too frantic, however, and considering the dearth of intellectual material on offer here, this will ensure Hotel Transylvania remains viewed only a few times before it becomes simply another babysitter. Drac’s cover of Lola seemed… inappropriate. The voice cast are all dynamite, particularly an indistinguishable Adam Sandler as Dracula. Seriously, I had no idea it was him until the credits came up, so I am pleased to say that his normal comedy man-child activities cast no such blight on this film. Selena Gomez plays Mavis with teenage insouciance, while Andy Samberg is no stranger to portraying dimwitted beta-characters (he voiced the equally mentally stunted Baby Brent in the Cloudy With A Chance Of Meatballs franchise) as Johnny, the pivot on which the plot swings. Steve Buscemi is instantly recognizable as Wayne Werewolf, making me think that he’s never going to be able to voice another character outside of Monsters Inc’s Randall with any sense of freshness, poor guy, while David Spade (as an Invisible Man, which is probably the most appropriate casting in film history, if you ask me! 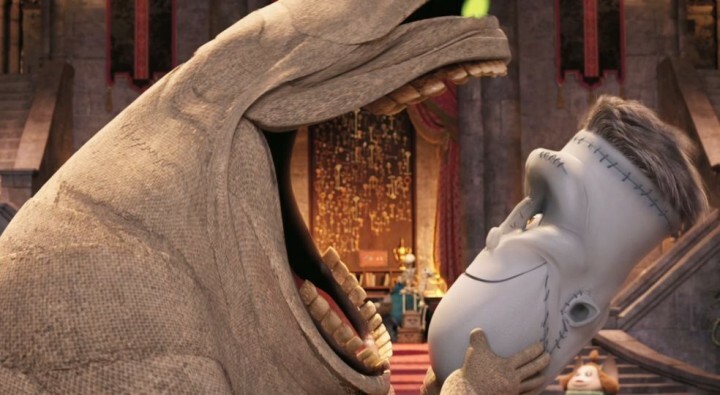 ), Jon Lovitz (as a hilarious Quasimodo – another monster most kids will only associate with as a Disney character) and Cee Lo Green (as the Mummy, looking suspiciously like Oogie Boogie from Tim Burton’s Nightmare Before Christmas) provide the male backup. Female voices include Fran Drescher (yes, really), as Frankenstein’s wife, Molly Shannon as Wayne’s wife, and Luenelle as one of the many shrunken heads hanging on the hotel’s doors. I’m a bit torn as to what rating to give this movie. On the one hand, the story is nothing new and offers little outside of its generic, stock-standard cliche plot. Lose points for that. On the other hand, the film’s dazzling animation and frantic, ADD-inspired pacing will maintain interest for those facing an oblivion of attention-drawing demands. It’s slick, cracking and mostly funny (although not so much that I can remember many of the jokes, they’re so scattershot) and delivers a sugar-hit of cinematic face-punching that initially overcomes its lackluster story. The characters support it with ease, but I think adults and older kids will probably lose interest on the second and third viewing. Considering the positives and negatives virtually counterbalance the movie, I’m inclined to give it a pass mark purely for making me chuckle more than twice. Oh, and getting me with not recognizing Adam Sandlers usually annoying voice. That’s worth an extra star.